Seventeen US Intelligence Agencies, including the CIA and the National Security Agency, have concluded that Russia interfered with the presidential election, setting off a bi-partisan call for an investigation from members of the Senate, House and a group of Presidential Electors. According to the New York Times, intelligence officials, in closed-door briefings with the White House and Congress, reported with " 'high confidence' that Russia acted covertly in the latter stages of the presidential campaign to harm Hillary Clinton's chances and promote Donald J. Trump." 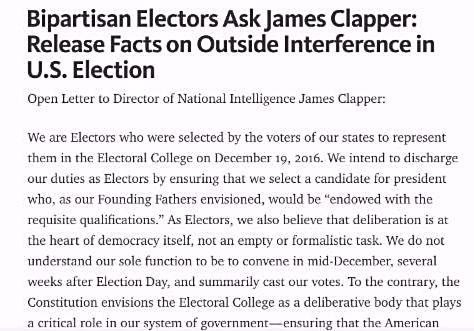 In an open letter to Director of National Intelligence James Clapper, a group of ten bi-partisan electors have requested a full intelligence briefing on foreign intervention in the presidential election - in advance of December 19th when the Electoral College will meet to officially cast its votes for the next president. The Electoral College is a group of elected representatives, chosen by the voters, who pledge to cast their state's votes for the presidential candidate who wins the popular vote margin within that state. Electors are not required to vote the same way that their state voted, but in most states "faithless" electors face a fine or misdemeanor charge for voting against the will of their state. The presidential election will become official following the vote by Electors next Monday, December 19th, and subsequent approval by the new 115th Congress once they are sworn in January 3, 2017. The letter, signed by electors from five states and the District of Columbia, points to "Alexander Hamilton's assertion in Federalist Paper #68 that a core purpose of the Electoral College was to prevent a "desire in foreign powers to gain an improper ascendant in our councils." "... the United States intelligence community has now concluded definitively that the Russian interference was performed to help Donald Trump get elected, yet ... In response to the reports, the Trump transition office instead released a statement which called into question the validity of United States intelligence findings, and declared the election over despite the Electoral College not yet casting its votes. ...We further require a briefing on all investigative findings, as these matters directly impact the core factors in our deliberations of whether Mr. Trump is fit to serve as President of the United States." DemList Convention Central: Media Credentials Deadline Today! DemList’s Convention Central, our weekly Convention round-up, kicks-off next week! In the interim, check out these resource links and today’s Convention Credentials Deadline!